The awning window adds a level of elegance and tradition to any house and the way that only an awning window can. Their unique design allows them to open out from the bottom so that allowed to circulate into/from the house while it's raining or snowing outside. 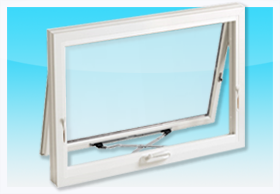 Visage Windows and Doors offers awning windows in single, stacked or side-by-side styles. The structure of the awning window is very similar as casement window which is 3 1/4" welded frame and sash, crank handle, premium lever lock, triple white co-extruded weather-strip sealing , 7/8" thermal warm edge sealed units, weather drainage channels hidden in front of exterior weather-stripping, removable spring loaded internal screens. Both homeowners and architects alike favour the awning in kitchens bathrooms and basement.